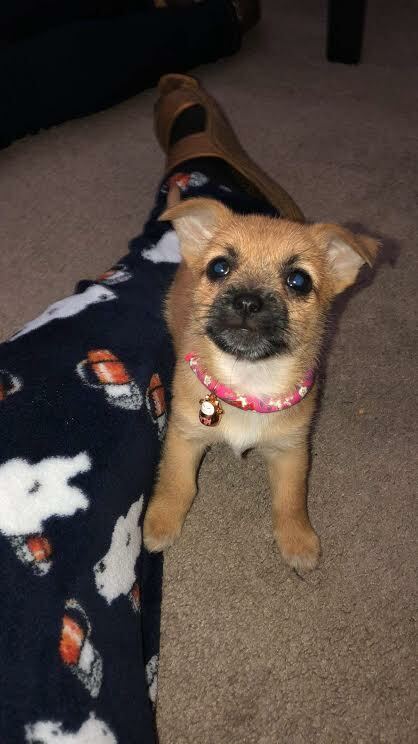 Puppy Frida is an adorable, sweet, gentle, loving 2 month old Wire Hair Terrier/Chihuahua mutt. She is a little girl with a great big heart! She will make a wonderful addition to a lucky home. Kids over 12 would be ideal because of the squish factor. She would do well in a home with nice cats, and nice, gentle dogs of similar size. Libby will be about 10-13 lbs full grown. The ideal home will have lots of time to devote and lots of cuddles to give! Adoption Donation: $325. She is dewormed, flea treated, up to date on her first puppy shot, microchipped. Adopters are responsible for finishing age appropriate shots, and providing proof of spay at 6 months of age. Once you submit your adoption form, we will contact you within 1-3 days. If it sounds like a match, we will promptly schedule a meet & greet at your home, the foster home, or the rescue by appointment. If you do not get the first dog you are interested in, we are happy to keep your application on file for new incoming dogs! Thank you for choosing adoption.